Every time I get a chance to watch one of our finance folks over at MobiTV wield a spreadsheet, I learn some new tricks. Those financial analysis folks steeped in the arcane features of Excel seem to be able to make the software package produce ever more astounding and useful models of increasingly complex systems. But this one takes the cake. Check out this really cool implementation of a 3D graphics rendering engine. IN EXCEL! Peter Rakos over at Gamasutra outdid himself. This image and video pair shows the rendering system using a simple display that colors the native Excel spreadsheet cells as the calculations are being performed. This image and video pair shows the same program using the Microsoft Office Graphics Abstraction Layer to do the rendering instead of using writes to the spreadsheet cell. Even better, some of the spatial layout and cell computation models of spreadsheets turn out to be very useful in designing and presenting very compact and elegant representations of the rendering pipeline. This design and layout in the 2-D spreadsheet grid is massively easier to see and understand than all the simple linear text files that I coded up in my college graphics course. It also makes the interrelationships and cell/function dependencies immediately obvious, and debugging is trivial with live previews of the calculations while the program is running. High cool. Now I don’t think anyone currently expects this to evolve into a real 3D simulation system, but it does point to some very interesting 2D layout programming paradigms that might very well turn out to be VERY useful in developing more complex software. It wouldn’t surprise me if the professional code development environments evolve towards this sort of thing within the next few years. And of course, 3D environments are just a step away. And I have a whole new animation tool for my next presentation! Yes, my favorites are all irreverent, but I just can’t resist. Check out the growing collection at the Fine Art Photoshop Contest posted here, where you can also see the un-retouched originals. No, this one is not animated. All the motion is happening in your head. If you don’t believe me, try covering most of the image with your hand or a piece of paper and only looking at a small part. You will see that no individual part of the image moves at all. It is only when you try to see the whole image that you notice motion. So can any of you tell me how this works? 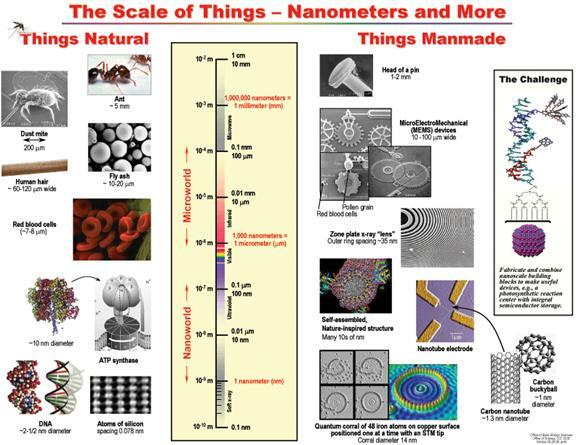 Understanding Nanotechnology has a nice chart that compares the scale and complexity of natural structures as compared to artificial ones we can fabricate.